You've worked diligently to build your dental practice. Now you need to market that. It isn't enough to simply HAVE a website. 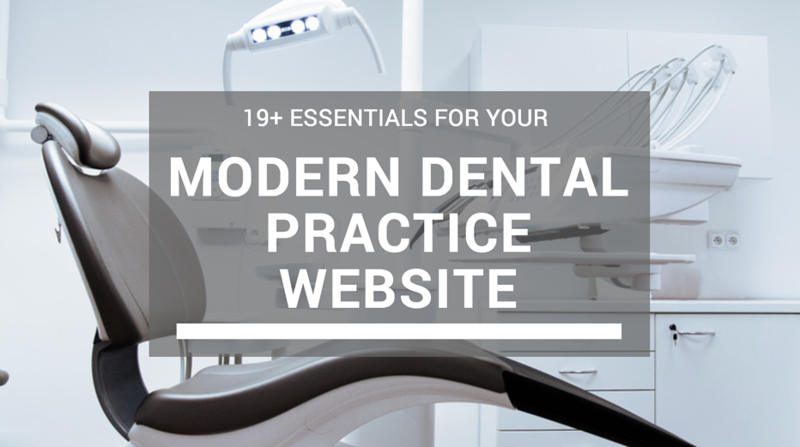 Your website should be your strongest dental marketing tool to enhance your patients' experience of your dental practice and make your team's jobs easier. Make sure your website is set up correctly. Let's start at the very beginning. Do you already have a website? Test the following website necessities yourself to make sure you have a strong foundation and talk to your web designer if you are coming up short in any of these key areas. If you don't already have a website, keep these questions in mind when you are building your new website. 1. Open your website on different devices. Our clients often ask us, "is my website mobile responsive?" Between 40 - 60 percent of all website traffic is logged on mobile devices so make sure your website adjusts to the all different sizes. #TWEETABLE Responsive website design services ensure that your website is seen in its best formatting. When your website is optimized for mobile devices, the menu, buttons, links, images and forms will be correctly sized and arranged for the size of your mobile device. 2. Look for SEO plugins on all of your website pages. All of your pages should employ technical "search engine optimization" tactics; this ensures you have correctly formatted every website page and blog post so Google and other search engines will index them for optimal reach to people looking for you online. Depending on the web editing software or content managing system (CMS) you use, there are a variety of technical SEO plugins and SEO audit tools to help you check this list for proper keyword usage and page formatting efficiencies. For Wordpress users, an example of this would be Yoast. 3. Link all of your practice's social media accounts in the right places. Your dental practice should have active accounts on Google+ and Facebook. Establishing a strong presence here will increase the strength of your search engine optimization, provide an outlet for communication with current and potential patients, and give your practice the opportunity to show its personality. In addition to these accounts, the doctors at your dental practice should have personal LinkedIn profiles filled with their accomplishments, certifications and job history. These accounts should be linked in the header or footer of every page so patients can easily interact with them, and connected wherever referenced inside the site pages and doctor profiles. 4. Ensure your patients can easily find the information they are looking for. 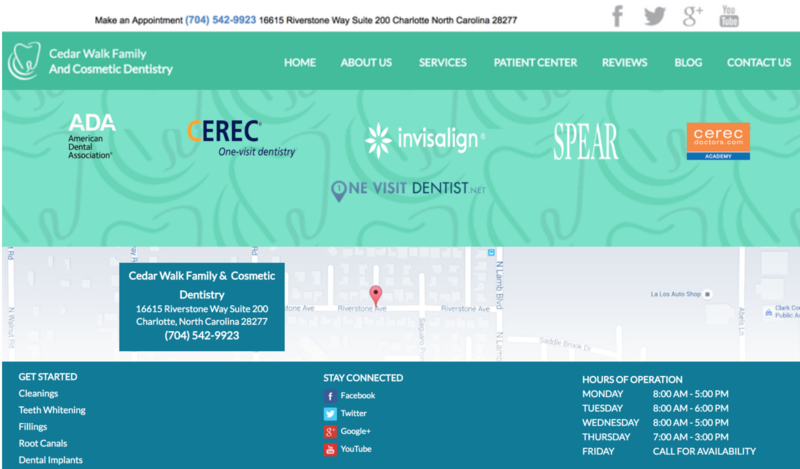 Your dental practice website should have your address, phone numbers and office hours on every page, preferably in the header, for easy communication. It is also important to provide an interactive map with intuitive directions embedded on your website. We suggest putting this map on your contact page and linked wherever appropriate. We use the Google Maps embed so patients can get directions without leaving your website. Build trust with your patients. TEAM - Your dental patients want to see real images of your practice's team. Pictures of your doctors and dental team help website visitors connect with your practice and give you the opportunity to introduce yourself with a personal touch before they come into your office. 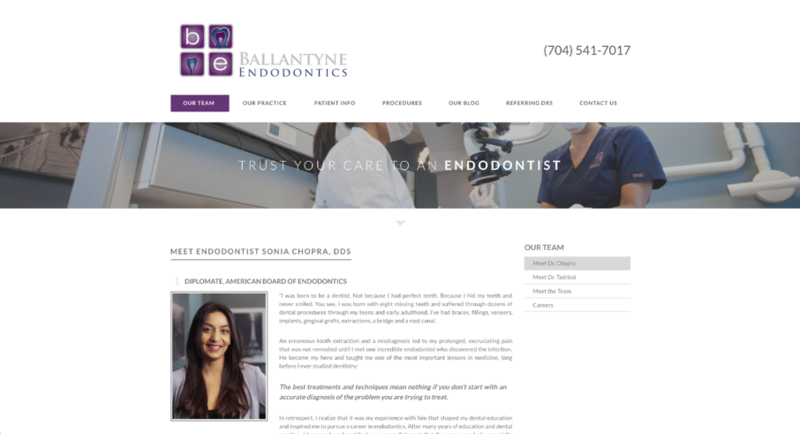 For all of our dental practices website sites, we create a "Team" page with group and individual pictures of each team member and their bio. Patients want to know who their appointments are with. Make it fun! 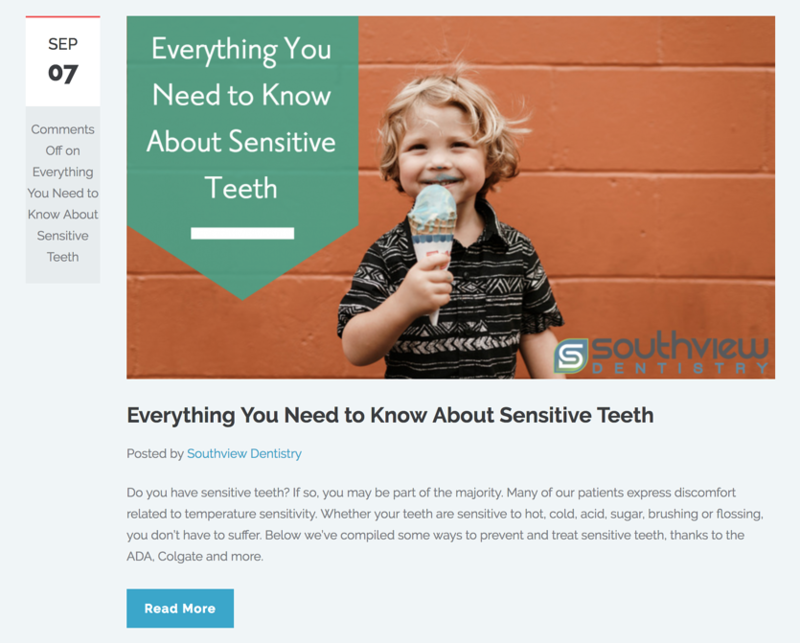 Include pets, hobbies, accomplishments, and more so patients can get to know your dental team and bring warmth to each team member's personality. PATIENTS - Include images of your dental patient before and afters with case studies about the procedures and services you provided. Your patients are your best advocates for your skills and services. #TWEETABLE Before any cosmetic or restorative dentistry procedure, make sure you take a photo of the patient smiling and a close up of their teeth you will be working on. After the procedure replicate those photos for a side-by-side comparison and case study. Remember, you don't have to be a professional photographer. High-quality images look great, but having real people in them are more important. Photos of real people on websites out-perform stock photos 95% of the time. Just make sure you get people's faces. 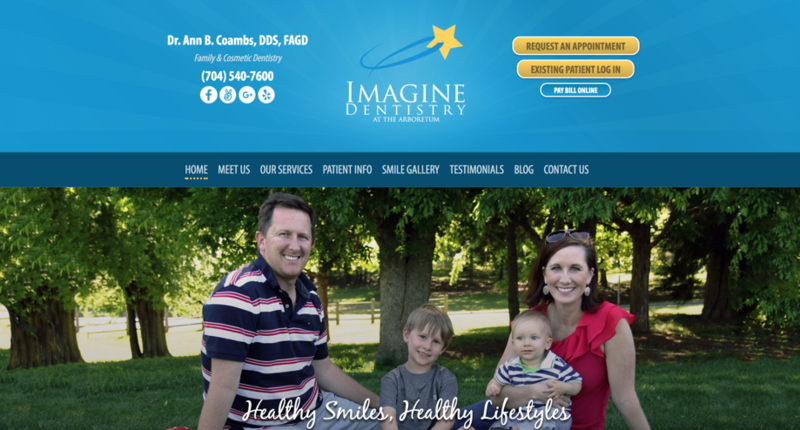 Our clients' web pages and advertisements perform best when we combine images of staff and smiling patients. 6. Focus on messaging for your patients. Don't just talk about yourself and your office. Yes, patients want to know what makes you different from all of the other dentists in the area, but they also want to know that their mouths are in good hands (or rather that good hands are in their mouths). Talk about their pain points and needs so they will find headlines, blog topics and services they can relate to. Blogging for dental practices can be quite easy if you take the time to do it, and it can show incredible ROI. In the past year, websites with a blog got 55% more views than websites that did not. #TWEETABLE In addition, regularly adding fresh content to your blog provides infinite content for your social media channels, too. (See it all works together!) Stumped about what to blog about? Start with the keyword strategy you created during your website development. Your keywords should revolve around specific services you want to rank for on the first page of search results in search engines. Giving more detailed information about your services, providing helpful dental resources like medications, diets and oral hygiene tips will help build trust with your current and future patients. 8. Brag about your dental patient reviews and testimonials. Patients want to hear from other patients. You can toot your horn all day about being the best in the business, but customers are more likely to trust the opinions of other customers rather than the business itself. How many reviews do you currently have on Facebook, Google, Yelp, Patient Connect and DemandForce? Our clients conduct two reviews campaigns a year using social media, email and raffles. It is important to feature these reviews on your practice's website as proof of your qualifications and service. 9. But you should still toot your own horn. Do the doctors in your dental office participate in study groups, continued education seminars and lectures or community events? Include these in your doctor's profile on your website along with any accreditations, association memberships and awards. Examples of these include CEREC, the CEREC Doctors Academy, Invisalign, Spear, the American Dental Association, the American Association of Endodontists, BIOLASE and TopDentists. 10. Promote the charities you work within the community. Show your patients that you are invested in the community. Cross-link to your favorite charity's website to bring awareness to their cause and show your worth as a valued donor and supporter. Get them to link to your website too for better SEO, too. 11. Give online visitors a virtual office tour. Some patients will visit your website because they are nervous about their appointment. Use your website as a tool to help them overcome their phobia of dentist offices by showing pictures of the building, the waiting area, the front office and the staff in their setting. This way, when they walk in, they know what to expect. 12. Up your ranking on Google and other search engines. 13. Give your ads a strong place to land. Use your individual service pages as the landing pages for your social media ads for dental services. This way the copy of the ad will match the content on the page your direct the link clicks to. Want to learn more about running advertisements on social media for dental practices? Contact us! 14. Advertise the promotions your dental practice is running. Are you offering free teeth whitening services? Does your dental office provide rebates for electric toothbrushes sold in office? Designate a page of your website to publicize these promotions with all of the necessary information. P.S. these pages can be shared on social media too - free advertising. Lessen your front desk's work load. 15. Include contact forms for new appointment requests. Parents are more likely to research family dental appointments after your office hours or on weekends. Providing a form to request an appointment online lets patients contact you when it is convenient for them and helps the front desk stay organized and off the phone on Monday mornings. 16. Make new patient forms available before appointments. 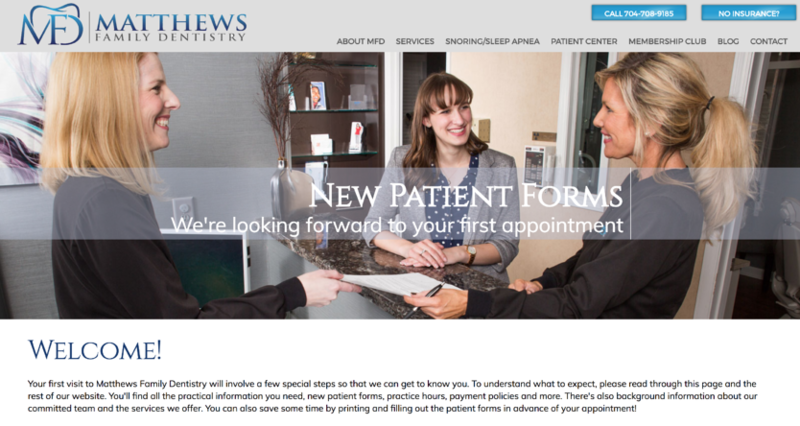 Want to expedite the new dental patient intake process and check in? Provide new patient forms online so patients can download and complete them prior to their appointment to help your front desk ensure your appointments start on time. 17. Answer your patients' FAQs. Answer your patients most frequently asked dental questions before they even get to their first appointment. Include the link in appointment reminder emails so patients can come prepared to their appointments and leave the front desk to handle different requests. 18. Clearly define your insurance policies. What insurance do you accept? Do you offer an in-house dental plan? These are questions your potential patients are already searching for online. The answers to these questions will, unfortunately, mean just as much to a potentially new patient than any of your reviews or services. Be transparent about how they can pay for your services so they aren't surprised after the appointment or have to cancel at the office. Try to keep as much of your dental practice's information on your own website for increased website traffic and SEO strength. Are you hiring? Post open positions and career opportunities on your website so you can share on social media and emails or direct potential applicants to the right place with all of the right information. BONUS: Book a 20 minute consult with us and we will audit your site and provide feedback with no obligation!